Uryu Ishida’s little contest has gotten out of control as the Hollow population grows exponentially larger. While Ichigo and Uryu battle the Hollows across the city, yet another of Ichigo’s regular friends are going to discover something inside themselves and finally see a glimpse of the life Ichigo has been living the past couple months. Meanwhile, Rukia has started to act strangely and no one knows why. Based on the popular manga series in Weekly Shonen Jump comes Bleach: Volume 4 from Viz Media. Episode thirteen begins with Ichigo frantically searching for his two sisters to make sure they’re not in danger. Luckily, he runs into Kon still trapped in Ichigo’s body. Sending the gikongan back to watch over the two girls, Ichigo decides to hunt down Ishida for causing this mess. Meanwhile, back at the school, Tatsuki, Orihime, and Chizuru have been stuck with the job of cleaning up all the broken glass after the windows mysteriously shattered. However, Orihime spots something odd sitting on one of the rooftops and tries to hurry her friends out the door. Tatsuki wants to change first, which gives the Hollow a chance to move behind Orihime and Chizuru. Chizuru can’t see anything, but Orihime can and she knows it’s dangerous. The Hollow hits Chizuru with a green goo and begins to take control of her body, like she’s a puppet. Orihime struggles to get out from her grip, but soon more classmates show up under the Hollow’s control. 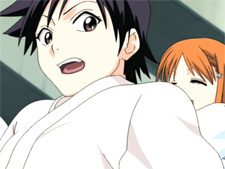 Only Tatsuki’s last-minute arrival helps save Orihime from the crowd. Tatsuki can’t see anything solid, but she knows that the Hollow is with them. The Hollow strikes Tatsuki and slowly takes over her body while Orihime weeps at losing the friend who has taken care of her all these years. Losing her temper, Orihime activates her own special powers in the form of fairies who follow her command. Elsewhere, Kon makes sure Ichigo’s sisters are safe and then runs across Rukia. Yet it seems Uryu Ishida has also found Rukia, as she was trying to battle a Hollow in her weakened state. Ichigo has also found the trio of warriors as the fourteenth episode begins. Ichigo wants nothing more than to beat the hell out of Uryu for this mess, and it looks like he may get his chance until they all notice the sky. Hollows are gathering overhead, and a huge crack has appeared as well. Ishida and Kurosaki are going to have to work together to deal with this mess. Luckily for them, Urahara and his band of employees have arrived to take care of the small stuff while Ichigo and Uryu take on what’s coming through the crack. Menos Grande is a Hollow created from hundreds of merged Hollows, and no one Soul Reaper could ever have enough energy to take it on alone. 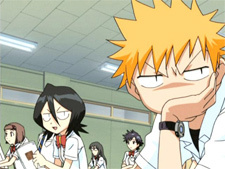 Yet Urahara suspects Ichigo just might, and he binds Rukia to stop her from interfering with the test. The final two episodes for this volume explore Rukia’s growing problems. Ichigo is a lot stronger than Rukia originally thought, and her own body has weakened greatly since she entered the temporary Gigai body. Knowing her days are numbered, Rukia tries to distance herself from Ichigo and the rest of her new human friends. However, Orihime is determined to buddy up with Rukia and tries repeatedly to get her to smile. It seems that Orihime has started to get a crush on her formerly-scary classmate. Orihime and the rest of the girls press Rukia to find out if she and Kurosaki are more than just friends, but Rukia continues to deny any romantic involvement. 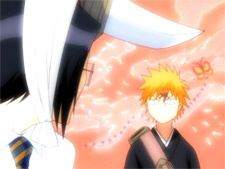 In a desperate move, Rukia runs away from the Kurosaki home before the Soul Society agents manage to find her. A Soul Reaper who has given their powers to a human is a serious crime. The human will be killed to give the powers back to the Soul Reaper who, in turn, is taken back to the Soul Society for their own death sentence (gee, how fair). Unfortunately, the ones hunting Rukia Kuchiki are Captain Byakuya Kuchiki and Vice-Captain Renji Arabai. 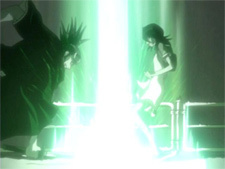 Renji strikes out at Rukia repeatedly, but she manages to dodge most of the attacks with only minor cuts. It’s the blue arrow streaking by her and striking Renji that startles the two. Uryu Ishida sensed Soul Reapers in the area and came to investigate, and naturally he’s not going to leave his classmate to fend for herself against these two. Bleach has fallen into a good spot with the storytelling, action, and humor needed to keep the series going. While Chad and Orihime have developed powers to combat the Hollows, Urahara has reminded them that the choice is theirs on whether or not they join Ichigo’s battle. The character designs and animation have been noticeably tweaked to give a better look to what was sometimes poor or simply dull. The improvements across the board show a lot of promise for this show. The Japanese cast rounds out with Yuki Matsuoka providing an impressive Orihime Inoue to listen to as she grows into her power and curiousity for Ichigo. Junko Noda’s Tatsuki Arisawa also plays off Matuoka’s Orihime nicely for these scenes. The English production by Studiopolis has improved for this volume with performances, but the script issues still come and go from scene to scene. Stephanie Sheh’s Orihime has some promise and Derek Stephen Prince settled well into the role of Uryu Ishida. Michelle Ruff and Fumiko Orikasa each present a slightly different take on Rukia’s depression, making for an interesting comparison of interpretation. Bleach: Volume 4 has found the sweet spot for action and character development as Rukia follows a darker path and Orihime finally gets a chance to shine. While the start of the series was shaky, I am really starting to look forward to each new volume. The video is clean and the subtitles contain no errors. The DVD extras are the usual clean ending credits, some production art, and a sticker sheet. Kon gets a funny subplot during episode fifteen and overall the character is a lot more active than in the last volume. It’s always amusing to have a lecherous doll as a character. Bleach: Volume 4 is a real start into a new story arc. What will to happen to Rukia, stuck in her Gigan body? How will the Soul Society take the news of a human carrying out the Soul Reaper duties so well? Volume 5 will hopefully solve some of these questions.